Partnerships are integral to the success of the DMC vision, so last week a variety of investors and innovators came together to explore how we can advance development and improve healthcare. The Mayo Clinic Center for Individualized Medicine (CIM) has always seen its Individualizing Medicine (IM) Conference as the gathering place for conversations about genomics in the clinical practice. They have a history of inviting genomics-related technology groups and professional societies to gather in Rochester in the days adjacent to the IM conference. For the past three years, they have hosted the Investors & Innovators Reception (I2R) as a part of the event to foster conversation, encourage collaborations, and grow partnerships. This year, the CIM partnered with DMC and Medical Alley Association to expand the collaboration opportunities to an audience beyond genomics with Investors and Innovators: A Day in Rochester. The highlight of the event was the “Minute Pitches” from startups and other organizations looking for growth opportunities. As short as a minute may seem, a pitch can be all it takes to spark the interest of a listener and ultimately result in a long-term relationship. One brief moment can have a considerable impact on providing innovative solutions to meet the needs of patients. 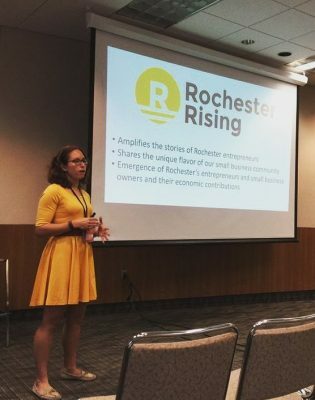 Unique events like I2R are key to Rochester’s growth over the next 10 years. Attendees were invited to get a closer glimpse at what’s already happening in business and development in Rochester during a downtown tour. We’re already looking forward to the next one – it will only get better. Information about the 2017 Individualized Medicine Conference and related events can be found here.